It once resided under most main TV sets in the UK, but with the advance of PVRs, DVDs, catch-up TV and streaming devices, the era of the Video Cassette Recorder (VCR) has long passed. Now it's been announced that the last device will be manufactured this month. According to Japan's Nikkei newspaper, Funai Electric will stop manufacturing VCRs at the end of this month. Funai is the last company still making the antiquated devices. In recent years, VCRs have been primarily shipped to China and other parts of East Asia, but even here demand has sharply fallen in recent years. 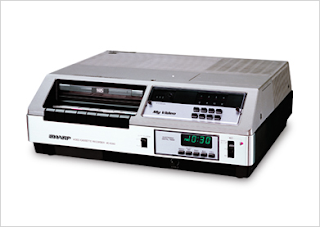 Video cassette recorders began to arrive in UK homes in the 1980s, but not before a battle between two competing standards: VHS and Betamax, which subsequently saw what critics called the inferior but cheaper VHS standard take the crown. To help viewers, especially those who didn't have a young person around to help programme the recorder, various technologies were tried and tested, including some VCRs that could process barcodes printed in TV listings magazines. VideoPlus (called ShowView in some countries) established itself as the norm, its system using a string of numbers published alongside listings that were to be entered into the VCR. UK TV listings publications have been quietly ditching the numbers from their listings in recent years, but they're still published in some continental listings magazines. In the UK, the launch of Sky+, a service inspired by TiVo, in 2001 revolutionised how we record TV, allowing the user to record, pause and instantly rewind live TV without the need for any tapes or discs. Sky's massive ad campaign for Sky+ changed consumer expectations forever. In subsequent years, all new digital TV platform operators launched their own version of the service, including "Freeview Playback", which later became Freeview+. While such devices took care of TV programmes, viewers bought their movies on DVDs that now could offer extra features. Today, with always-on broadband internet and streaming devices, even DVDs and bluray discs are threatened with oblivion with the likes of Netflix and Sky Store available on most connected devices: streaming killed the video star.